Outdoor Living Concepts in Palm Desert, introduces stainless steel outdoor cabinetry by Brown Jordan Cabinetry. 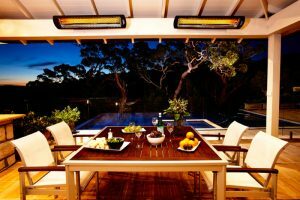 Brown Jordan Outdoor Kitchens, the leading luxury outdoor cabinet manufacturer, designs cabinets that bring your outdoor living space together, while adding a sense of style, beauty and comfort to the backyard, as a whole. Cabinets are an essential part of any kitchen – indoors or out. They tie together your best-in-class appliances with storage and provide your outdoor living and entertainment space with a unique look and style. Cabinets are the vital component in the outdoor world. That’s why Brown Jordan Outdoor Kitchens concentrates solely on the production and elite design of stainless steel cabinetry. Brown Jordan Outdoor Kitchens offers the widest range of storage and organizational cabinetry in the industry. With cabinetry available in 3” [wide] increments starting from 9” to 48” in certain styles. Like its indoor counterpart, the cabinet features include concealed soft-close stainless door hinges, and features such as trash pullouts, fixed and sliding shelves, soft-close, and self-close drawers. They arrive fully assembled with leveling legs to help ensure a quality, level set up, regardless of your prepared surface. The versatility of the cabinets provides designers and homeowners with infinite layout options when designing their outdoor kitchen. The exclusive easy alignment design system allows for quick yet precise installation with less labor than wood cabinetry, as each cabinet stands alone and has quick connect features. Access holes in key locations for plumbing and electrical installation reduces the need for drilling, cutting and boring. A handful of tools and easy-to-follow directions is all it takes to assemble your one of a kind Brown Jordan Outdoor Kitchen. 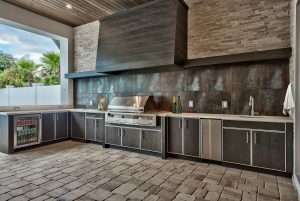 Brown Jordan Outdoor Kitchens offers hundreds of cabinets designed to accommodate the most creative layouts in settings as diverse as the backyard, rooftop, balcony, poolside or wherever your outdoor entertaining takes place. Available in 3” increments from 9” to 48” (in certain styles), creativity takes precedence. Base cabinets are available to fit almost any manufacturers’ appliance – from grills and smokers to bartending stations and kegerators. Each cabinet features real, usable storage. The doors are standard with soft-close hinges and the drawers have double wall construction, full-extension undermount glides and are soft-close/self-close. In addition, we offer options such as trash pulls and fixed or sliding shelves. The cabinets’ polished interior conceals any hardware or screw heads, providing a clean, attractive finish. Arriving on site fully assembled with leveling legs for ease of installation, the cabinets are available in 24” or 27” depths to accommodate the appropriate appliances. Engineered and pre-cut to accommodate electrical and plumbing, the cabinets are easily connected and can be installed in a fraction of the time required for the more traditional stone and stucco islands. Brown Jordan Outdoor Kitchens offers corner units and tall cabinets that can be used for storage or house wall ovens and appliances. These specialty cabinets are 34 ½” high. The tall cabinets are 24” deep and the corner units come in a standard outdoor cabinet depth of 27 7/8” or a 24 7/8” if requested. 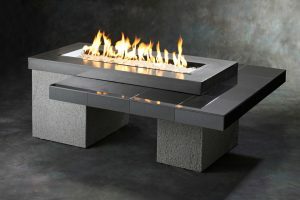 A square shaped tapered stainless steel leg with adjustable foot is also available for an open contemporary look. In addition, Brown Jordan Outdoor Kitchens also manufactures a complete line of ADA-compliant (Americans with Disabilities Act) cabinetry. Full Height Door cabinetry is available in 3” increments, from 9” to 48” widths. 24” wide cabinets can be specified with one or two doors. While the standard outdoor cabinet depth is 27 7/8” (including door), a 24 7/8” depth may be specified. Total height is 34 1/2”. The cabinet box is 30”H plus 4 1/2” adjustable legs. A square shaped tapered stainless steel leg with adjustable foot is also available for an open contemporary look. Black or stainless toe kick may be ordered separately and cut on-site. Stainless pulls are included. Shelves are optional – fixed or pull out. The OBF and the Door/Drawer Cabinets (OBD) are also adapted for pull out trash containers. Door/Drawer Cabinets are available in 3” increments from 9” to 39” widths. While the standard outdoor cabinet depth is 27 7/8” (including door), a 24 7/8” depth may be specified (standard depth for indoor use). Total height is 34 1/2” – the cabinet box is 30”H plus 4 1/2” adjustable legs. A tapered stainless steel leg with adjustable foot is also available for an open contemporary look. Black urethane and stainless “toe kick” are ordered separately and cut on-site. Stainless pulls are included. Stationary and pull-out shelves are available. Drawers display premium features including double-wall construction, full extension, under-mount glides and “soft-close, self-close” technology. Under Sink cabinetry is available in 3” increments, from 15” to 48” widths. 24” wide cabinets can be specified with one or two doors. Cabinets under 24″ in width have one door. While the standard outdoor cabinet depth is 27 7/8” (including door), a 24 7/8” depth may be specified. Total height is 34 1/2”. The cabinet box is 30”H plus 4 1/2” adjustable legs. A square shaped tapered stainless steel leg with adjustable foot is also available for an open contemporary look. Black or stainless toe kick may be ordered separately and cut on-site. Stainless pulls are included. Doors have a PVC core to add “heft” and weight to provide a solid close and feel. Shelves are optional – fixed or pull out. Appliance cabinets have been designed to accommodate side burners, gourmet power burners in both standard height and new low version for “boils”, bartending/cocktail stations, sear pods, pizza ovens, egg smoker grills, etc. Extra depth cabinets are available in most every size to accommodate those specialty cooking appliances that require. Brown Jordan not only has stainless steel cabinetry for the most coveted outdoor kitchen appliances and bartending centers on the market, we also sell them. Whether you want Alfresco, Viking, Solaire, Saffire, Tuscan Chef, Glastender Home and others, we offer them under one roof so to speak. Bornw Jordan not only has stainless steel cabinetry for the most coveted cooking appliances and bartending centers on the market, we also sell them. The cabinet shown is the OBB3002L (low) designed specifically for the Alfresco Versa-Power Burner so when using large stock pots , the chef can check inside for proper cooking. Appliance bases are specified 6” wider than appliance/specialty grill width. Include appliance brand and model specifications for quote or with order. A “trim kit” is specifically designed for each appliance to insure a proper fit. (Shown: OBC4802 in optional Nu-Black powder coat finish for use with a 42″ Glastender Cocktail Station). Brown Jordan Outdoor Kitchens offers stainless steel modular wall cabinetry providing designers and home owners with endless flexibility in design configurations – and to truly give the homeowner the feeling of being in an inside kitchen. Wall cabinetry is available in 3” increments from 12” to 36” wide, with a 13” outside dimension and standard heights from 15” to 42”. The cabinet line includes diagonal corner and blind corner wall cabinets, and each cabinet has two furnished 24” to 36” wide doors. Every cabinet comes complete with a top and bottom finished panel, stainless pulls, and European style stainless hinges & hardware. Doors may be ordered in different styles with and opening for glass. Like standard cabinets, powder coat options are also available for wall cabinets. For low to no maintenance requirements, rich designer powder coat colors or faux wood species are available to keep the cabinets protected from all weather conditions. Brown Jordan offers Grill Base Cabinets in many door and drawer configurations, including grill bases that include a warming drawer or refrigerator. Be sure to contact us if you have any questions. Grill base cabinets are available in widths from 27” to 62”. Grill bases are specified 6” wider than grill width. Include grill brand and specifications for quote or with order. A “trim kit” is specifically designed for each appliance to insure a proper fit. Standard outdoor cabinet depth is 27 7/8”. Total height is 34 1/2” — cabinet box is 30”H plus 4 1/2” adjustable legs. A tapered stainless steel leg with adjustable foot is also available for an open contemporary look. Black and stainless “toe kick” are ordered separately and cut on-site. Stainless pulls are included. Stationary and pull-out shelves are available. Grill cabinets are available with wood grain or powder coat painted finishes. Brown Jordan Outdoor Kitchens features eight door styles; three exclusive to the brand. All door and drawer fronts are constructed from commercial grade stainless steel and are available in a standard #4 brush finish or powder coated in an exclusive color selected to match your Brown Jordan furniture. We can also powder coat the stainless steel with a realistic wood grain in eight different species, giving your outdoor kitchen the look of wood without the maintenance. The Hampton Door is a solid slab door style that is made of vertical #4 brushed stainless steel. It is our standard door and drawer front. The Key West is a five piece stainless steel shaker-style door, featuring 2 11/16″ wide stiles and rails. 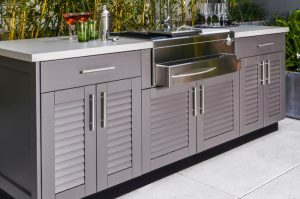 The center panel can be plain stainless steel or powder coated with your choice of color or wood grain finish from the Brown Jordan Outdoor Kitchens’ palette. Brown Jordan Outdoor Kitchens’ Key West doors also have the option of a textured stainless panel. The Key West Frost features our classic Key West frame with a frosted glass center panel, available in your choice of any color from the Brown Jordan Outdoor Kitchens’ palette. The Rio is a flat one piece, vertical #4 brushed stainless steel door frame that is prepped for a glass insert, wood grain insert or stainless steel panel (not included). The Brown Jordan Outdoor Kitchen colors are applied through a powder coat finishing process, protecting your cabinets from harsh chemicals such as chlorine, salt from the ocean and muriatic acid. This process creates a virtually maintenance-free finish in any weather environment. The variety of rich powder coat finishes will make your outdoor kitchen feel more like an outdoor living area and less like a traditional barbeque. Brown Jordan Outdoor Kitchens features ten different powder coat finishes and nine different species of wood grain powder coat finish allowing you the opportunity to match your Brown Jordan furniture or fit into your outdoor color theme. Insert options for doors, such as the Palm Beach or Key West, include any of the wood grain finishes, textured metals or any of our powder coat finishes.